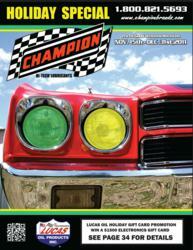 The Distribution Division of Champion Brands teams up with Lucas Oil for a holiday gift card promotion. Champion Brands is excited to announce a gift card promotion that will be part of the company's Holiday Special flyer. The promotion will give one lucky winner a $1500 electronics gift card, a great prize for the holiday season. Running from Nov. 15th through the end of the year, the Holiday Gift Card Promotion gives buyers a chance to enter a drawing, depending on what they order, with each entry giving them a chance at the $1500 prize. The flyer is sent out semi-monthly to store-owners, installers and distributors across the Midwest. Champion Brands is excited to work with Lucas again this year on the holiday promotion. Champion Brands has worked in alliance with Lucas Oil on other contests in the past that have included gun giveaways and racing trips. These have always been very popular with customers. About Lucas Oil: Lucas Oil headquarters are in Corona, CA. Founded in 1989, Lucas is manufacturer and distributor of automotive chemicals. Lucas Oil is involved in numerous ventures, from dirt-track racing to speed boating. They currently hold the naming rights to Lucas Oil Stadium in Indianapolis, IN.